*Disclosure: We are a professional review site that receives compensation from the companies whose products we review. You’ve purchased your first guitar, or finally have time to pick up and play one that’s been passed down to you. What comes next? If you’re lucky, you have the time and financial means to hire a private teacher locally for in-person guitar instruction. If you’re like most new players, you’d like to learn some basics online before hooking up with a local instructor who offers guitar lessons in the style you prefer. This makes a lot of sense! The internet has made music lessons more accessible to everyone, particularly beginners who want to learn the ropes before making an investment in their musical education. Whether you want to play acoustic or electric, or a little bit of both, you’ll find that there are plenty of great sites offering online guitar lessons, either in subscription format or via webcam. Take a look around, check out the sites, and start learning guitar. Most of all, have fun! Guitar Tricks was developed to provide a step-by-step curriculum for beginning guitar players as well as those with more advanced skills. With a library containing more than 700 songs, 11,000 lessons, and qualified instructors from all over the world. It’s been around since 1998 and is easily among the best sites for online guitar lessons – plus it offers a fantastic library of backing tracks in different keys so that you can get a feel for playing with other musicians even when you’re alone. The site offers insight into all genres of guitar, and in case you’re on the fence, there is plenty of free content to help you decide whether Guitar Tricks is right for you. A membership provides complete access to everything on the site. The sixty-day satisfaction guarantee inspires confidence in the company’s ability to deliver on its promises. You can even try Guitar Tricks free for 14 days before making a commitment! With more than 400 courses and well over 80 guitar teachers to choose from, JamPlay is a leading source of online guitar lessons for beginners and beyond. You can choose from pre-recorded or live lessons, and the site also offers live Q&A sessions each day. Open mic nights let you hear what other guitar students are up to and show off your own skills. The live learning platform comes with your membership, and so do all the other resources found here, including games, licks, tracks to play along with, and a massive library of songs to learn. JamPlay costs more than some of its competitors, but you get a free trial before committing, so you can determine whether you’re ready to invest. This site has something for everyone, from beginner to expert, with every style imaginable. Founded by music legend Hal Leonard, Guitar Instructor distinguishes itself by offering six different learning styles for beginners. Users can choose from electric or acoustic guitar lessons, online guitar lessons for kids or a video course. The traditional method area is based on Hal Leonard’s best-selling guitar method, and the classical method area uses music by famous composers to help beginning guitarists learn how to play classical guitar. Once you’ve learned the basics, you’ll find tons of songs to learn and if you’d like lessons, you’ll find a wide range of instructors to help you learn your preferred style. Guitar Instructor offers monthly subscriptions, plus a seven-day free trial. Whether you want to learn rock guitar, take blues lessons, or get into a country music state of mind, you’ll find plenty of great lessons, tabs, and more at ArtistWorks. Top instructors share their knowledge, helping you learn the fundamentals as you make your way from beginner lessons to intermediate songs. The ArtistWorks menu isn’t quite as large as you’ll find at some other sites, and there is no free trial membership. All the same, it’s a fantastic source for students who are ready to get serious. You’ll find here is of excellent quality, plus you can record videos, which your teacher reviews before providing you with direct feedback and helpful tips on improving your style. In all, the site offers more than 2,000 lessons, over 100 songs, and a great interactive community. Hands down, Justin Guitar is the best site for free online guitar lessons, with more than 1,000 video lessons to choose from, tons of songs, outstanding style tips, and plenty of well-organized reference material. Where some free guitar lessons are lacking, Justin Guitar’s stand out by offering excellent organization and sound methodology. While it’s not nearly as fancy as some of the other guitar sites reviewed here, it’s a great place to start out if you’re a beginner on a tight budget. You can make a donation if you’d like to help the site grow, but there’s no requirement to do so. Nate Savage is an expert when it comes to online guitar lessons for beginners – he has more than ten years’ experience, and he’s familiar with the obstacles students encounter. Today, Nick is featured at Guitar Lessons by Guitareo, a fantastic online guitar lessons site that offers a wealth of free content to help new players get started, plus a vast variety of content for beginners and intermediate players. 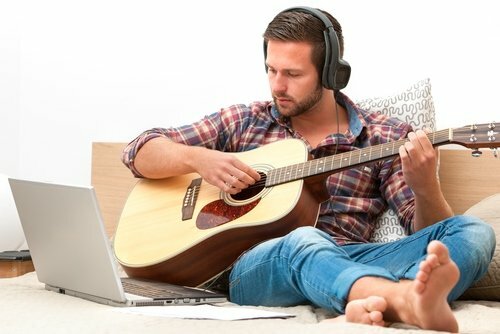 Like many other top guitar sites, Guitar Lessons offers beginning techniques for acoustic and electric, plus instruction in different styles of music including blues, bluegrass, metal, country, and more. Beginners can get started for free. With plenty of videos, eBooks, and PDFs in its library, Jamorama is a great site for online guitar lessons, particularly for beginners. You’ll get a good grasp on the basics, and you’ll never be bored, since new video lessons are added on a monthly basis. You’ll learn chords and basic progression here, plus you can learn how to maintain your guitar. What’s missing? There’s not a lot of live interaction here, although there is a growing community of users who help keep you motivated and offer plenty of social media style interaction. There are also some gamified features, which help make learning a lot more fun. Sign up is free, and prices are lower than you’ll find at most other sites. Guitar Compass got its start back in the 1980s, when cassette tapes and videos were the best resources beginning guitarists had when no live instructor was available. Over the years, the system has evolved, and now, students have access to streaming videos, jam tracks, tabs, and other materials. This site is simply designed, with all free and premium materials neatly organized for easy access. Prices are highly competitive, and there is a 7-day free trial for those who are interested in a premium membership. Like many other top guitar lessons sites, Guitar Compass generously provides access to free items even when visitors don’t sign up. Fretjam is a fantastic source for free online guitar lessons, and it’s a great place to pick up theory. Subscribers get a free chord book, and there are loads of other free resources available. This site is different as it places a strong focus on developing your own unique style, and even writing your own music. It’s well worth a visit, whether your brand new to guitar or if you’ve been playing for a while. The site is truly free to use! At Hub Guitar, the stated mission is simple: To create guitar players! With hundreds of free online guitar lessons, lots of great musicianship resources, and plenty of advice on offer, this site is a great one for learning basic technique and picking up some songs along the way. If you’re ready to progress to the next level, you’ll be glad to discover that instructor Grey Arney offers one-on-one guitar lessons via Skype. This site is newer than some others, and it’s a bit smaller. Still, it is well worth a visit! Thanks to a variety of options and many sites offering free trials, it’s easier than ever to learn guitar online. But how to choose the one that’s best for you? Here are some considerations to keep in mind. Value – Free online guitar lessons are everywhere, and they’re a great way to get started. Once you’re ready to take your technique to the next step, you’ll need to pay for lessons or a subscription. There are options to meet nearly every budget, but keep in mind that price isn’t the only factor to consider. See if you like the way the site is organized, and find out what you’re getting with your subscription. In-person lessons or pre-recorded lessons – In-person lessons are fantastic, but they’re going to cost more than pre-recorded ones. It’s a good idea to go with some pre-recorded lessons as you learn your basic techniques, since they can be paused and played as many times as needed. You’ll get more from live lessons when you’re ready to learn special techniques – and it’s great to get instant feedback without having to leave home! Of course, it’s also nice to know that you can find a guitar instructor online anytime you run into a stumbling block! Most people like to use a blend of pre-recorded lessons and in-person instruction. Be sure to visit a variety of sites and compare features for yourself. Additionally, it’s a great idea to look for other sources of inspiration as you learn to play guitar online! Beginners’ guitar lessons are essential. But it’s also important to develop your ear for music by listening to others play – particularly if you’re trying to pick up a specific style that calls for special techniques. The more you listen and watch, the better your results are likely to be, and the sooner you’ll be able to play your favorite songs. Most of all, have fun! Music makes life so much richer, and there’s nothing quite like playing the guitar. We wish you the best of luck finding the best online guitar lessons for your needs!